JOSETTA MARIA MATTERI 1928 - 2018 Passed away at her home, surrounded by family, on November 17, 2018, at the age of 90. Josetta was born in San Colombano/Lucca, Italy on September 7, 1928. She grew up working on the family farm to help keep food on the table. She immigrated to the United States at age 20, following the end of the 2nd World War. Upon her arrival in the U.S., she lived with an uncle in Petaluma, CA, where she met Lincoln Matteri, who would become her husband on September 3, 1949. Lincoln found employment with Hammond Lumber Company in Samoa, CA and soon thereafter Josetta and Lincoln purchased their home in Arcata where they resided for the remainder of their lives. Josetta had a strong work ethic. She took English classes while working at the California Barrel Factory in Arcata until the birth of her first son. She continued learning English and earned a high school diploma, graduating highest in her class, at the Eureka Adult Education program. She worked at Payless (later Value Giant and Longs Drugs) and at Hensel's in Arcata. 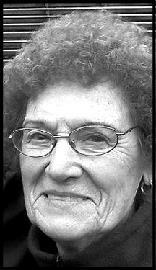 She managed and maintained family and rental properties, and she volunteered countless hours in many capacities at St. Mary's Church in Arcata. Josetta is preceded in death by her parents, Pietro and Carlotta Lorenzetti, her husband Lincoln, two brothers, Ugo and Roberto, and four sisters, Anna, Erica, Lydia, and Rosina. She is survived by her children, Robert Matteri (wife Patricia) of Vallejo, CA, Peter Matteri of Arcata, CA, Michael Matteri (wife Cathy) of Arcata, CA, grandchildren Michael, David, Alan (wife Jessica), Heather (husband Steven Burger), Kandace, Nicholas, Ryan, Rachel and Rebekah Matteri, and one great-granddaughter, five-month-old Rosalee Burger. Josetta is also survived by many cousins, nieces, nephews and their families in Central California and in Italy. Josetta loved God, her family and friends. She was devoted to caring for her family and the needs of others. She was a long-standing member of St. Mary's Catholic Church and Altar Society as well as the Italian Catholic Federation. Josetta's faith, strength, courage and dignity in life, and in passing, set an example for all. She was deeply loved by her family and friends and she will be missed dearly. Services are scheduled for Saturday, November 24 including a viewing between 10:00 am and 11:30 am at Paul's Chapel, 1070 H St in Arcata, CA; a rosary and funeral mass at 1:30 pm with a reception immediately following at St. Mary's Catholic Church, 1690 Janes Road, Arcata, CA.